LE GRAND-LUCE, France — In a country where a chateau for sale is hardly a rarity, certain exceptional examples stand out. The Château du Grand-Lucé is one of them. Secluded behind high walls on the edge of this town in the Loire Valley of France, about a half-hour’s drive south of Le Mans, the white limestone chateau is a protected national landmark, considered one of the finest examples of 18th- century neo-Classical style in France. Grand-Lucé was built between 1760 and 1764 by the engineer Mathieu de Bayeux for Jacques III Pineau de Viennay, Baron de Lucé. As Louis XV’s intendant, the powerful baron administered the entire region of eastern France from Strasbourg and supervised the avant-garde design of his future summer palace from there. His new chateau featured soaring ceilings and graceful enfilades of light-filled, perfectly proportioned rooms. Splendid gardens were laid out over descending terraces with a vaulted orangery, greenhouses, a private lake and copies of royal Versailles statuary sent by Louis XV as a housewarming gift. The original plans and letters between the owner and his engineer/architect of this “chateau by correspondence” are now in the French national archives. As the story goes, when the baron came to inspect his masterpiece after years of planning and construction, his first sight was his last. He was so overcome with emotion that he had a heart attack and died on the spot. His daughter, Louise, inherited the estate. When a fire swept the village in 1781, burning down most of the wooden houses, she welcomed the villagers to Grand-Lucé and paid for rebuilding their destroyed homes in the local stone. Eight years later, the villagers repaid their benefactress by protecting her during the French Revolution. Grand-Lucé was one of the rare chateaus to survive the conflict with its collections complete. The property stayed in the family until the 1920s, and then in private hands until the 1940s, when it was lent to the British as a military hospital. It was sold to the Sarthe regional government in 1948. In 1996, the government decided to step in to save the landmark. When the estate was put up for sale in 2002, the state had spent about 6 million euros, or $6.6 million at current exchange rates — including €940,000 for the chateau’s new slate roof — to restore the property. 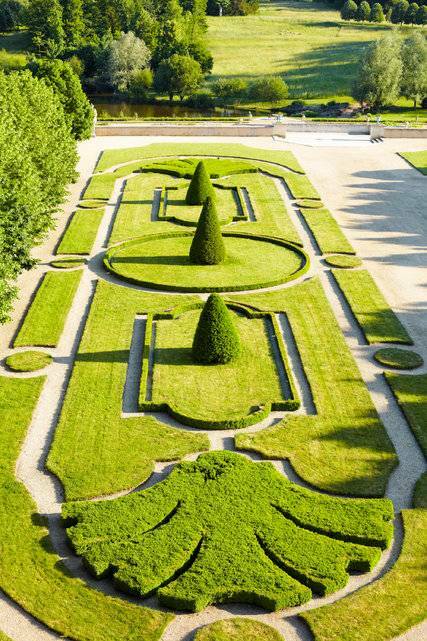 Most notably, Grand-Lucé’s extensive gardens were recreated and then opened to the public. Timothy Corrigan, an interior designer based in Los Angeles, was in the midst of renovating his towered and turreted Renaissance chateau near Angers, France, when the news that the renowned estate was for sale proved irresistible. But his first sight of the building brought doubts. Far from being lost in the countryside, the property gives onto the main market square on the edge of town. The cour d’honneur, or front courtyard, was being used as the village parking lot. Once he was inside the chateau itself, Mr. Corrigan said, his doubts disappeared. The house is oriented toward the opposite direction. From its south-facing grand rooms, views range over formal gardens, historic woods, meadows and a private lake to offer countryside vistas as far as the eye can see. As he walked through the neo-Classical rooms, Mr. Corrigan recalled, he felt immediately at home. And soon he was at home. Triumphing over commercial rivals, Mr. Corrigan became the chateau’s first 21st-century private owner, in 2004. If you wonder how the acquisition of a French chateau can change your life, Mr. Corrigan is the man to ask. A former advertising executive, he changed careers when he found restoring his first chateau in the 1980s and early ’90s more compelling than his job. In 1996, he gave up advertising to become a designer specializing in historic restoration and living a bicontinental lifestyle between Los Angeles and Paris. His decorative style — restoring inherent European elegance while skillfully incorporating Californian comfort — attracted a following. “I became the go-to guy for advice about chateau restoration,” he recalled when we met in Paris. His career zoomed into fast-forward as he amassed a clientele that included European and Middle Eastern royalty, corporate leaders and show business bold names. From 2007, he has been one of the AD 100, Architectural Digest’s annual Who’s Who list of the decorating profession. The government’s rehabilitation of the estate left the chateau in good structural condition, but most of the interiors of more than 25 rooms had been left untouched since the 1950s. Some updates were practical: Two bathrooms burgeoned into 15 en suite baths in master and guest bedrooms along with two powder rooms. Others were aesthetic. Like ghost-busters restoring the paneling, his teams used heat guns to melt off centuries of paint — coat over coat — that had obscured the exquisite hand-carved details. Furnishing and decoration came next. “Without a doubt, it is the biggest chateau renovation I’ve ever done,” Mr. Corrigan said. “Making rooms with five-meter high ceilings feel cozy was a real creative challenge,” he said referring to 16-foot-high rooms. Grand-Lucé’s restoration also brought a self-revelation. “As I moved from chateau to chateau, I thought I was searching for perfection, for better boiseries, for better gardens. But here, I found the perfect chateau,” he said. “I thought I would stay forever. 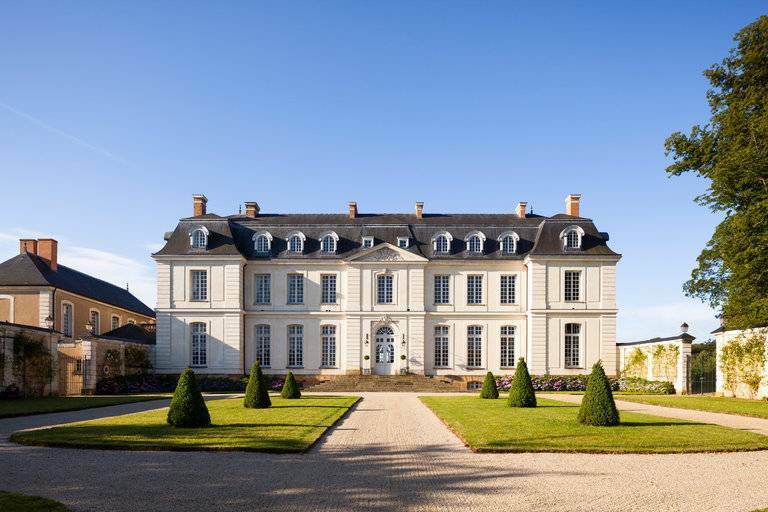 He has put the 3,716-square-meter, or 40,000-square-foot, listed landmark chateau, surrounded by 30 walled hectares, or 74 acres, on the market. It is being offered at €10 million unfurnished, or at €13 million including all furnishings listed in a 1,000-page inventory. “Grand-Lucé is quite magnificent — as chateaus should be and rarely are,” said Elizabeth Stribling, chairwoman of the luxury New York brokerage firm Stribling & Associates, in a telephone interview. She is overseeing the sale. Restoring a landmark building, or “monument historique,” with France’s architectural watchdogs looking over your shoulder takes diplomacy and imagination. The monument commission closely oversees decorative elements, from the paint on the walls to the trees in the park. From the monumental front gates, a gravel walk leads through the formal garden of grass and clipped yew cones that replaced the cobblestone front courtyard. Stone stairs rise to the front entrance that opens into the entrance hall. 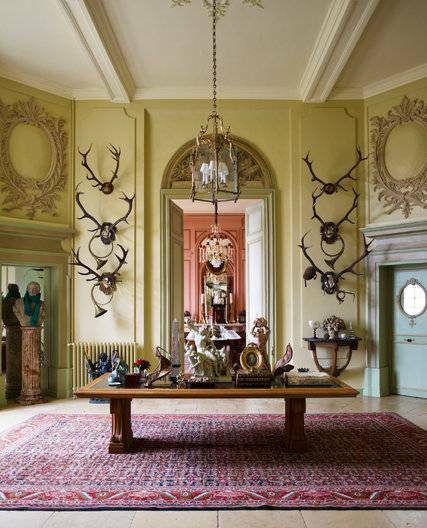 A collection of vintage antlers is arrayed on cream-colored walls in a nod to the estate’s hunting origins. To walk through the residence today is to appreciate Mr. Corrigan’s ingenuity and diplomatic persuasion. The designer’s extensive archival research into 18th- century colors at the Carnavalet Museum in Paris won official approval for a considerable transformation. 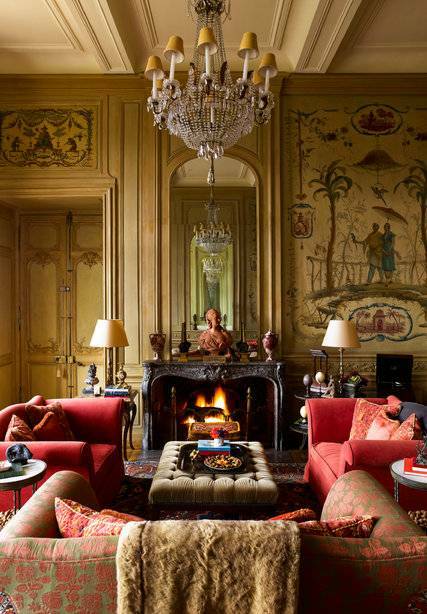 Acres of paneling that were once painted in de rigueur 18th-century Trianon Gray now glow in more colorful hues. From the entree, tall double doors lead to the formal dining room and one of Mr. Corrigan’s wow moments. It is stunningly painted in a persimmon pink shade chosen to flatter guests’ complexions in flickering candlelight. Antique portraits, including ones of Emperor Napoleon III and Empress Eugenie, overlook an antique dining table that seats up to 28 people. Straight ahead from the entry hall, the Grand Salon is a serene, oval room wrapped in boiseries of pale celadon green. Even on a gray, rainy day, light floods in from its bay of three 22-foot French windows linking the greenery indoors to the gardens below. “If it is beautiful, but not comfortable, it is not successful” is the designer’s motto. Here, the soaring oval space is anchored with symmetrical seating areas of white sofas flanked by two armchairs on each side of the room. Above the fireplace, two arched interior windows reveal views of Grand-Lucé’s treasure, the exquisite Chinese Salon in the next room. During the day the owner likes to set up a desk here in his favorite room where enchanting chinoiserie garden vignettes painted by the 18th-century master Jean-Baptiste Pillement cover the walls. In the evening, when a fire crackles in the fireplace, the salon is a favorite setting for pre-dinner drinks. Continuing along the enfilade, the sumptuous master suite has sun and views south and west. It also includes a luxury master bath and a master dressing room. 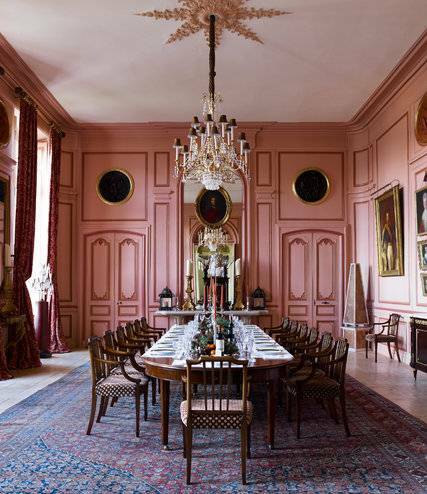 From the Grand Salon, the same south-facing enfilade runs in the opposite direction through an informal dining room carved from a former boudoir to a new contemporary kitchen with parquet floor, marble-topped island and high stools. There is also a pantry, a den/television room and an apple-green library. An elevator descends to the garden level. It also serves the ground and first upper floors. On the first upper floor, the large hallway leading to nine bedroom suites is decorated like a sitting room. A wooden staircase leads up to the second upper floor and its five bedroom suites. Four additional bedrooms are unrestored. The red and black décor of the room Diamantes, with a top hat rakishly decorating the fireplace mantel, was imagined for a dandy. Lucé, a large oval room, decorated in shades of blue, is a favorite of honeymooners. A female English writer — Virginia Woolf, perhaps — was the inspiration for a corner room with an English giltwood mirror, Swedish canopy bed crown and superb garden view. On the lower level are two wine cellars. Also restored is an orangery and two greenhouses along with the former stables, now converted into a theater. There is a gym and games room adjoining the chateau, while the original chapel, hidden since the Revolution, was rediscovered and also restored.